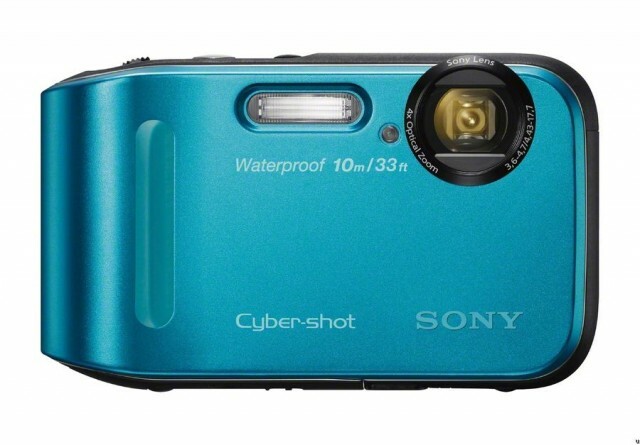 The Sony Cyber-shot DSC-TF1 isn't afraid to get its hands dirty. It's waterproof up to 10 meters, dustproof, shockproof to 1.5m and freezeproof to -10°C (14°F). At least, that's what we're told. The Cyber-shot DSC-TF1 is a decent package surrounded in deceptive marketing. It's a rugged camera built to go with you, but it's not strong enough to take on any sort of extreme adventure. It's a strictly point-and-shoot camera that's good enough for the average user, but even then we recommend exercising caution. You'll love the looks, size, and weight: just don't get too rough with it. Sony has a tradition of making slim, sleek cameras, and the DSC-TF1 is no exception. Weighing in at a little over 5 ounces, the camera is lightweight and fits comfortably in the palm. The front of the camera is plain except for the lens and flash, while the back sports a 2.7" LCD and buttons for navigating the menu. The top of the camera sports buttons for power, flash, and zoom, while the right side (facing the back) houses the SD card slot. The DSC-TF1 is designed for photos, although it will take 720p video at a moderate frame rate. The built-in image stabilizer (Sony's own "SteadyShot") works surprisingly well and keeps shakiness to a minimum. Photos can be taken up to 16 MP, with modes for panoramic views up to 360°. Photos are detailed, and the lens contains a CCD sensor that automatically regulates the amount of light that appears in each pixel. The DSC-TF1 features a 4X optical zoom lens with a range of 25-100mm and an aperture of f/3.6-4.7. The DSC-TF1 records about 95 minutes of video, equating to about 200 photos. The camera falls behind when it comes to speed, with a startup time of 1.7 seconds, a shutter delay of 0.4 seconds and a shutter release time of 0.1 seconds. You have nearly 3 seconds of wait time between photos. The camera does include a burst mode, which takes up to 100 shots at a laughable 1 fps. This camera is a point-and-shoot in every sense of the word. Sony provides a dizzying array of processing effects, shooting modes, and customizations for the DSC-TF1. The built-in microphone is mediocre at best, capturing sound only in mono quality. The camera is rated to be lifeproof, but feels fragile. This sentiment is only redoubled by the manufacturer, who "depending on use conditions and circumstances, [makes no guarantee] regarding damage to, malfunction of, or the water-proof performance of this camera". The DSC-TF1 might be water, dust, shock, and freeze resistant, but don't let that be an invitation to take it on your next snowboarding trip. The DSC-TF1 is a camera designed for form and style that just so happens to be wrapped in a disaster-resistant case. If you're looking for a point-and-shoot camera that will turn heads, this is the camera for you.